Callipterinella calliptera apterae (see first picture below) are yellowish green to bluish-green, usually with dark transverse bands on all tergites. The antennal terminal process is about 1.75 times the length of the base of the last antennal segment. The body length of Callipterinella calliptera apterae is 1.5-2.5 mm. Alate Callipterinella calliptera (see second picture above) have less well developed dorsal markings. Immature Callipterinella calliptera are yellowish-green with rows of dark tubercles on the abdominal dorsum. Black banded birch aphids are found in ant-attended groups on the young shoots and under leaves of birch (Betula species), sometimes inside leaves sewn up by lepidopterous larvae. Callipterinella calliptera is found on both silver birch (Betula pendula) and downy birch (Betula pubescens) in Europe, and on other birch species in east Asia. Oviparae and alate males occur in September-October. Callipterinella calliptera occurs throughout Europe and across Asia, and has been introduced to North America. Callipterinella calliptera seems to be rather less common in Britain than its congener, Callipterinella tuberculata. We have only found Callipterinella calliptera once, at Burton Pond Nature Reserve in West Sussex on Betula pendula. It was ant attended and feeding openly on a birch leaf. 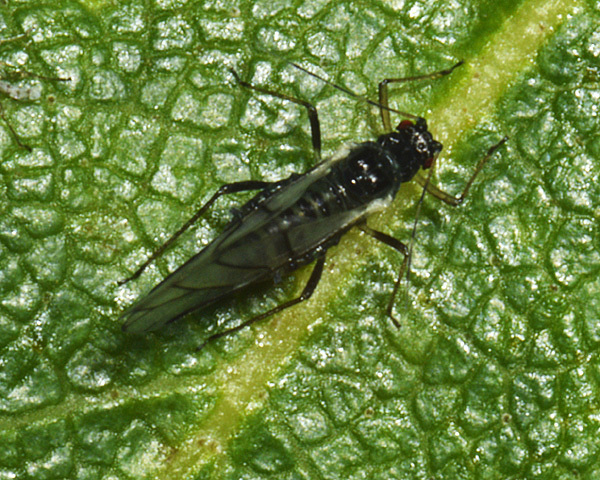 Most of what we know about the ecology of Callipterinella calliptera comes from studies carried out on three sympatric aphid species of European origin (Callipterinella calliptera, Euceraphis betulae and Betulaphis brevipilosa) feeding on Betula pendula in northern California. Hajek & Dahlsten (1988) described the ecology of Callipterinella calliptera in California. The species overwinters as eggs on the wood of dormant trees. Its eggs are laid in cracks and crevices, in leaf scars and under the apices of bracts of male catkins and on branch terminals. Callipterinella calliptera populations increased during late summer while feeding on mature leaves. Hajek & Dahlsten (1986) studied resource partitioning by the three introduced species. Resources were partitioned by plant part, feeding sites within leaves and leaf phenological state. Overall niche overlap between species reached a maximum of 50% between Betulaphis brevipilosa and Callipterinella calliptera. Co-occurrence of Euceraphis betulae with both other species on leaves was random while Callipterinella calliptera and Betulaphis brevipilosa were more likely to occur together. California populations of Euceraphis betulae and Betulaphis brevipilosa appeared to utilize resources in a fashion similar to endemic Danish populations. This was not the case for Callipterinella calliptera because Danish (? European) populations usually feed inside leaves silked together by spiders or Lepidoptera whilst in California Callipterinella calliptera also commonly feed on exposed leaf surfaces. Hajek & Dahlsten concluded that Callipterinella calliptera had expanded its endemic niche, and by doing so occupied the most generalized niche of the three species studied. However, the only time we have found Callipterinella calliptera in Britain it was feeding openly on a birch leaf. Despite examining many leaves sewn up by lepidopterous larvae, we have been unable to find any black-banded birch aphids enclosed within them. So perhaps the habit of living inside sewn up leaves is not as general in European populations as previously supposed. Hajek & Dahlsten (1988) noted that Callipterinella calliptera was the only ant attended aphid of the three aphid species studied, and that it developed the largest populations of the three. The viviparous females that we found in Britain were attended by Formica fusca (see picture below). 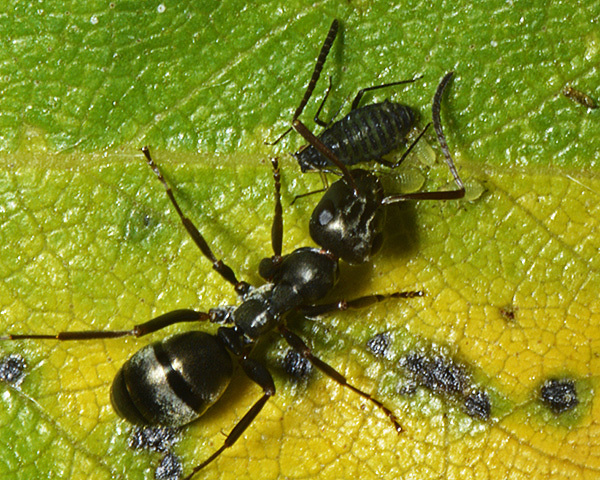 Formica fusca is not commonly reported in mutualistic relations with aphids. In USA this ant species was instead found to be preying on the aphids (Aphthargelia symphoricarpi) such that, in experiments, ant predation reduced both the growth rate and the density of aphid populations (Andersen, 1991). But other authors have found Formica fusca in mutualistic relationships with aphids. For example, Addicott (1979) found that low density populations of Aphis helianthi and Aphis varians tended by Formica fusca were less likely to decline than untended populations. 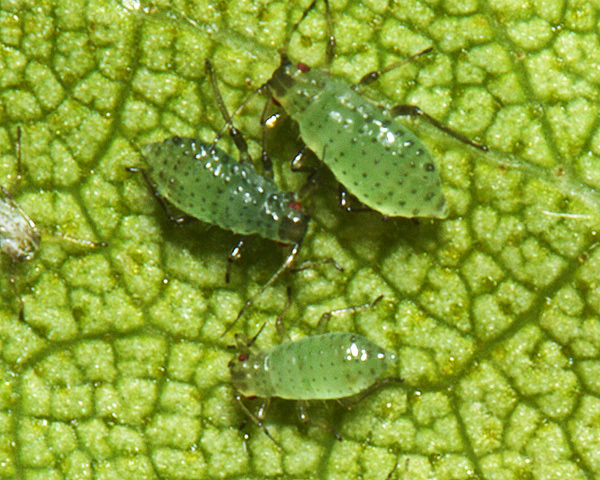 Hajek & Dahlsten (1987) looked at predation of birch aphids by the coccinellid Adalia bipunctata, the most common aphid predator on silver birch in northern California. 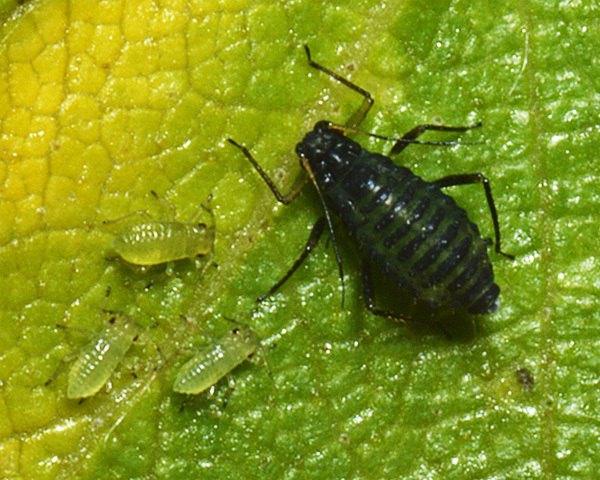 Active escape behaviour was more effective for aphids than passive avoidance of detection. Fourth instars of Callipterinella calliptera escaped from coccinellid larvae more frequently when approached from the front, apparently using vision for pre-contact detection of the coccinellid. 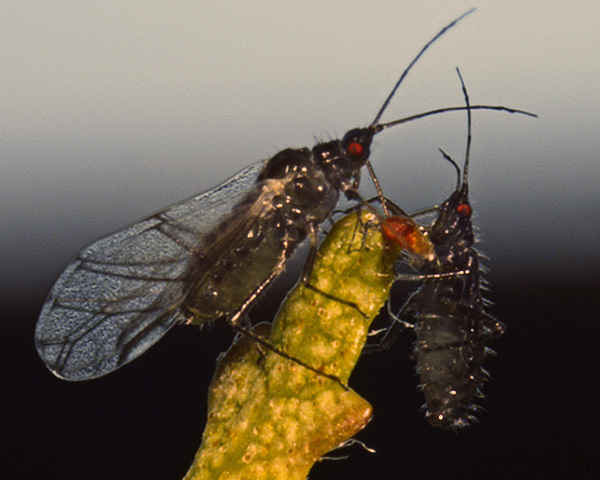 Level of predation on three aphid species was dependent upon types of aphid defense. Callipterinella calliptera was not as efficient at avoiding capture as Euceraphis betulae. Callipterinella calliptera seldom kicked predators or dropped from leaves, although predators were often sensed by aphids without contact and aphids usually just walked away from them. 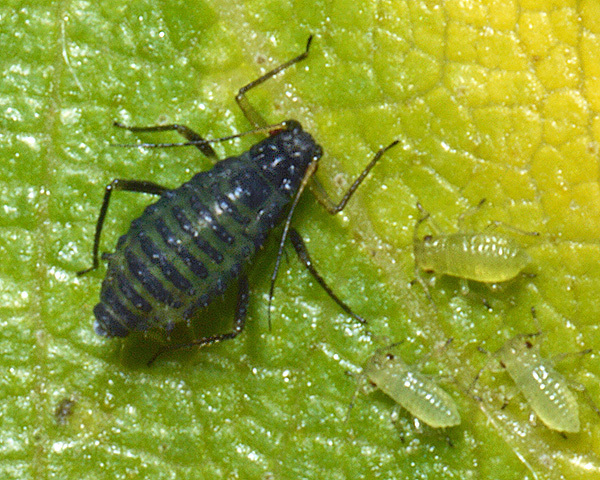 Nevertheless, both aphid instars were readily captured by fourth instar larval coccinellids. Callipterinella calliptera has been recorded from at least 10 Betula species.